Homes remain unoccupied for a variety of different reasons, notes Trusted Choice, part of Independent Insurance Agents and Brokers of America, Inc.
You own more than one residence and divide your time between houses. You are doing extensive renovations on your primary residence. You are traveling for an extended period of time. You moved into a new home leaving a vacant house on the market. Some companies offer coverage for vacant homes as an addendum to an existing homeowner’s policy. Detached structures or other personal property may need additional coverage. The amount of coverage you need depends on several factors. In general, the longer the house is vacant, the greater risk. With no one home to keep an eye on things, there is no one to notice when things go wrong. Vacant home insurance will typically cover physical damage to your home, including weather damage as well as vandalism and some liability. Because certain risks increase with an unoccupied property, vacant house insurance is typically more expensive than a standard homeowner’s policy. If you’re only adding an addendum to your current policy, it may be more affordable, but just make sure it includes all the coverage you need. Fortunately, insurers will typically return any unused premiums if the house becomes occupied before the end of the policy’s time period. Factors that affect your premium can include your geographic location, the home’s value, the amount of coverage you purchase, and the safety of the house. Since risk is the biggest concern for insurance companies, you may be able to reduce your rates if you have a home security system. 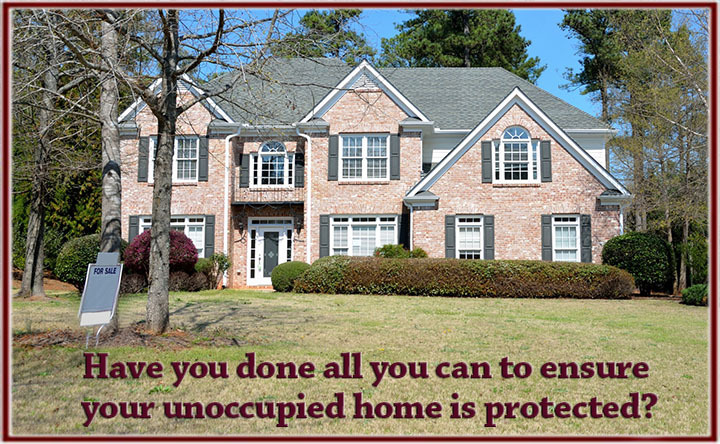 If you know your home is going to be unoccupied for a lengthy period of time, check your current homeowner’s policy. Your insurance company may be willing to work with you to ensure your home’s coverage continues during that vacancy. For example, your insurance company may extend your current policy for a specific time period, after which you would need to purchase additional coverage. When you’re actively trying to rent your home, you may not need vacant house insurance if you expect it to be occupied within a short span of time. If you’re currently renovating it to rent to someone next year, vacant home insurance will protect your investment. Vacant property insurance may be a wise investment if your home is on the market, especially because it’s hard to predict when a house will sell. Just make sure you purchase a policy that will refund premiums if the house becomes occupied. If the home is not to be heated, have the fuel turned off at the main shut-off valve to reduce the malfunction/explosion potential. The valve should be checked to ensure it is working properly. If hot water heating system and/or water pipes will not be drained, have a water flow sensor and low temperature sensor installed and hooked into a centrally monitored alarm system; and keep the thermostat at a consistent temperature throughout the winter months.